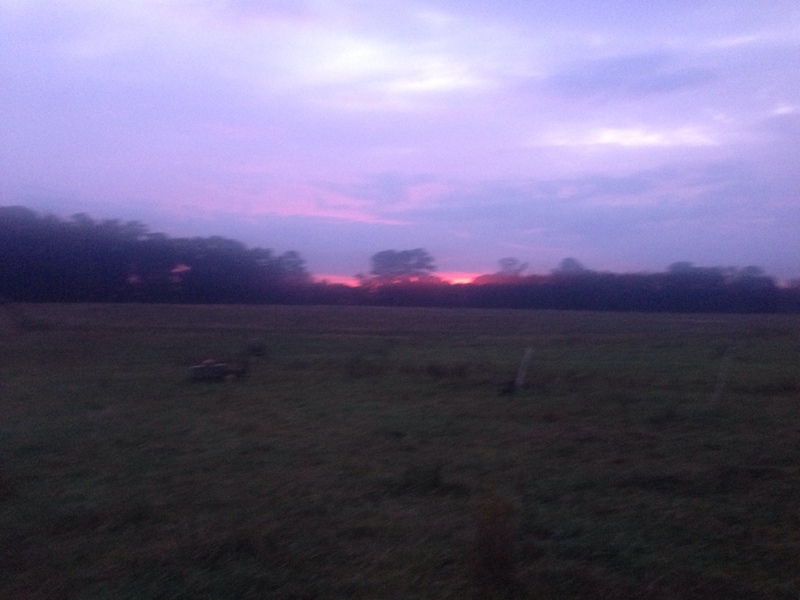 This morning sunrise as we finished our chores. The Princess is the photographer. The cold weather has abated somewhat this morning although it was still 45 degrees when we started. The cows were up and ready to move this morning as the Princess and I made our way over to them. All 24 cows were looking good and even in the pre-dawn light they went straight to eating. The paddock they are on today which is the beginning of the main pasture close to the woods as we come across from the pasture by the golf course road has some really good looking grass. They should have a belly full by mid-morning. We also fed the pigs this morning what we didn’t get them last night. The scarfed it up in just a few minutes and were back begging for more. They will get a good load of food this afternoon so the fat little piglets can get a bit fatter. They are getting seriously round, like little oinker cherubs. We have another farmer interested in buying a couple of our piglets plus we need to take two of the pink pigs and have them processed. Then we are saving two pink pigs for the hog killing class. That will leave us with Penelope and 7 kids for the winter. With our Latin source of winter food, we should be in good shape for the winter after all the changes.